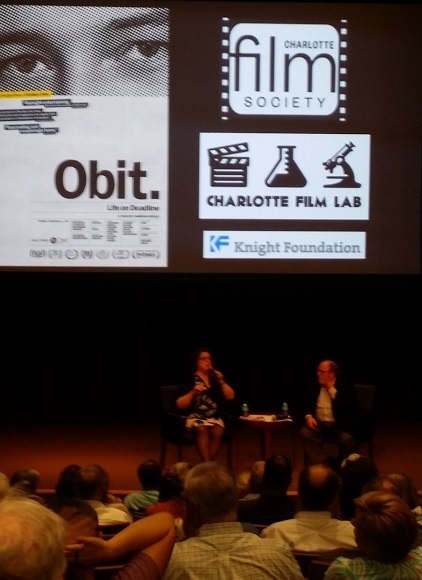 My wife and I caught a pre-screening of the documentary “Obit” last night. It introduces the general public to the people and the process of crafting the obituaries of both famous and significant people who have died. Now from that lede, you’re probably thinking this must be a yawner of a movie. In fact, it’s not only one of the most entertaining movies I’ve seen in years, it’s also an illuminating commentary on writing. In the picture above, New York Times reporter Margalit Fox fields questions from the audience. She’s the “baby” of the obituary staff, and gets much face time in the documentary. Margalit offered a useful example of what the old pro meant. In one of her first obits, she identified the deceased’s father as a “Democratic congressman from Illinois.” An irritated relative informed Margalit that her uncle had in fact been a Republican. “I assumed he was a Democrat because he was from Illinois,” confessed Margalit. “But my obit would’ve been just as good if I’d only described the deceased’s father as ‘a congressman from Illinois. '” Lesson learned: Less is better. Another joke was about an experienced reporter whose editor told him to write a short report on a breaking story. “I can give you a 5,000-word story,” said the reporter. “I don’t have enough time to write a short report.” He had a point — short works are hard to do. Bottom line, don’t miss this documentary. The characters (starting with the madcap manager of the New York Times’s morgue), the tension created by meeting deadlines while treating the bereaved family with respect and sympathy, and the fundamental difficulty of “getting the words right” make “Obit” a must see. Highly recommended. Nice review, Mike. The point about avoiding facts is interesting. That seems like wise advice when it comes to describing real people. That’s all the description we get. And all we need. That’s a well-chosen title for your post. I was wondering about someone that rates such a movie “must see,” yet I feel I would enjoy “Obit” myself, so I should not wonder too much. Thanks for the running this one up the flagpole; I hope to make time for it. If you’d walked in late and heard the audience laughing, you’d think they were watching Airplane! or Blazing Saddles.